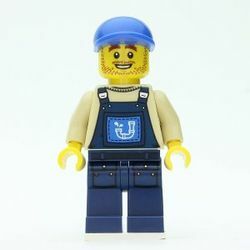 Plumber Joe is a minifigure released in 2014 as part of the LEGO Movie theme. Plumber Joe wears a blue hat and has a scruffy smiling face. His torso is a cream color and on it there are dark blue overalls, this continues onto his legs which also have pocket printing. On the overalls is a large blue pocket or patch with a pipe in the shape of the letter J, to reflect his name. His arms are also cream and he has yellow hands. He is similar to the Plumber from Series 9 of the Collectable Minifigures theme, but there are clear differences. This page was last edited on 9 June 2015, at 17:10.